Megadrine RFA-1 is an advanced thermogenic complex. If you liked the Original Xenadrine RFA-1 and it's successor Superdrine RX-10, you'll love Megadrine RFA-1 from the National Institute for Clinical Weight Loss. Megadrine RFA-1 is a superior diet pill thermogenic formula that rivals Xenadrine RFA-1, which athletes, figure competitors, and weight loss people have been excited about for many years. Megadrine RFA-1 delivers the thermogenic fat burning ingredients found in Xenadrine RFA-1’s first diet pill product. Megadrine RFA-1 is a revolutionary fat loss thermogenic formula that supports weight loss and fat loss while allowing you to keep your muscle mass. 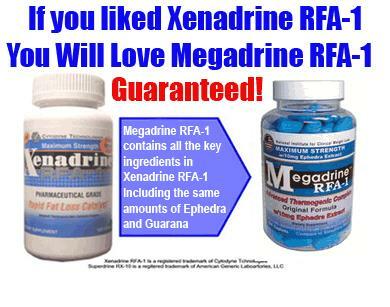 Buy Megadrine RFA-1 and achieve the same results you did with Original Xenadrine RFA-1. WARNINGS: Not for use by individuals under the age of 18 years. Do not use if you are pregnant or nursing. Taking more than the recommended serving may result in heart attack, stroke, seizure or death. Consult a health care practitioner prior to use if you have high blood pressure, heart or thyroid disease, diabetes, difficulty urinating, prostate enlargement, or glaucoma, or are using any prescription drug. Do not use if you are taking a MAO inhibitor or any allergy, asthma, or cold medication. Discontinue use if dizziness, sleeplessness, loss of appetite, or nausea occurs. I love this product. After many years of fighting food cravings and low energy, especially in the winter, I have finally found something that works! This is a pill that helps me to feel full and have the energy to get to the gym every day. I'm about one week in with using RFA-1 and have lost 5 lbs. My body wants healthy foods now and the RFA-1 helps me to keep on track. It really works and I love this product! Xenadrine was the only diet pill that worked for me, and I have tried everything since it has gone off the market. Now that Megadrine is back, I am skinnier and happier than ever!